the before announced collections of the vols. 31–60 of the Bod kyi lo rgyus rnam thar phyogs bsgrigs, the fourth set of the bKa' gdams gsung 'bum (vols. 91–120), and the first 30 volumes of a large collection on works of bKa' 'brgyud masters all inputted and edited by dPal brtsegs still await their final publication. However, I put together a new update of publications, newer and older ones, that might be of interest for you. 1. sTong skor Tshe ring thar. Gangs ti se bon gzhung rig mdzod dpe tshogs. Mi rigs dpe skrun khang, 25 vols., 2010. ISBN 978-7-105-11019-3. 2. Don grub rdo rje (ed.). Gung thang bstan pa'i sgron me'i gsung 'bum, 11 vols. (ka–da; hardcover), Mi rigs dpe skrun khang, 2006/07. ISBN 978-7-105-05376-6. The Collected Works of Gung thang bsTan pa'i sgron me (1762–1823). 3. bSe tshang blo bzang dpal ldan gyi gsung 'bum, Mi rigs dpe skrun khang, 9 vols. (hardcover), 2010 (2nd edition). ISBN 978-7-105-11087-2. The Collected Works of bSe tshang Blo bzang dpal ldan (b. 1938). 4. Chab spel gyi gsung rtsom dang rig gzhung bsam blo'i zhib 'jug dpe tshogs, Krung go'i bod rig pa dpe skrun khang, 2008. 1. Chab spel tshe brtan phun tshogs kyi dpyad rtsom phyogs bsgrigs (stod cha). 4. Rig gzhung bsam blo'i zhib 'jug skor gyi dpyad rtsom phyogs bsgrigs. 5. Chab spel tshe brtan phun tshogs kyi rtsom rig brtsams chos phyogs bsgrigs. 7. rTsod spongs lo rgyus smra ba'i rnam dpyod: Chab spel tshe brtan phun tshogs kyi rig gzhung bsam blo'i zhib 'jug skor gyi dpyad rtsom phyogs bsrgigs. tshogs lags la bcar 'di zhus pa'i zin tho. The author, Chos 'phel (b. 1945), of the travel guides I listed below visited most of the places by riding his bike and conducted interviews with the monastic communities in the field. These guide books include colored pictures of the monasteries and hermitages visited as wells as maps locating the individual places. 1. Chos 'phel (b. 1945). Gangs can ljongs kyi gnas bshad lam yig gsar ma: lHo kha sa khul gyi gnas yig. Mi rigs dep skrun khang, 146 pp., 2007 (2nd edition). ISBN 978-7-105-05049-9. 2. Chos 'phel (b. 1945). Gangs can ljongs kyi gnas bshad lam yig gsar ma: lHa sa sa khul gyi gnas yig. Mi rigs dep skrun khang, 251 pp., 2010 (4th edition). ISBN 978-7-105-06422-9. 3. Chos 'phel (b. 1945). Gangs can ljongs kyi gnas bshad lam yig gsar ma: gZhis rtse sa khul gyi gnas yig. Mi rigs dep skrun khang, 213 pp., 2008. ISBN 978-7-105-09225-3. 4. Chos 'phel (b. 1945). Gangs can ljongs kyi gnas bshad lam yig gsar ma: mNga' ris khul gyi gnas yig. Mi rigs dep skrun khang, 139 pp., 2008. ISBN 978-7-105-09794-4. 1. Chab 'phel Tshe brtan phun tshogs and Nor brang 'O rgyan (b. 1933). Bod kyi lo rgyus rags rim g.yu yi phreng ba. Bod ljongs mi dmangs dpe skrun khang, 3 vol. (stod cha, 717 pp. ; bar cha, 700 pp. ; smad cha, 812 pp. ), 2006 (2nd edition). One of the best and detailed histories of Tibet authored by two well known Tibetan scholars. ISBN 7-80589-069-2. 2. Phun tshogs tshe ring. Deb ther kun gsal me long. Bod ljongs mi dmangs dpe skrun khang, 505 pp., 2010 (6th edition). ISBN 978-7-223-00005-5. A History of Tibet until the 1950s. 1. Gu ge Tshe ring rgyal po (b. 1961). mNga' ris chos 'byung gangs ljongs mdzes rgyan. Bod ljongs mi dmangs dpe skrun khang, 485 pp. (A4 size, softcover), 2006. ISBN 7-223-01904-2. The religious history of mNga' ris features the following three main chapters: 1. sTod mnga' ris kyi sngon byung lo rgyus (pp. 1–75), sTod mnga' ris kyi dgon sde khag gi lo rgyus rgyas spros (pp. 76–453), and 3. as appendices lists of old texts available in research institutions of mNga' ris and biographies of famous persons from mNga' ris (pp. 454–481). The book also includes lots of colored pictures of the introduced monasteries, their statues and murals as well as maps locating the individual monasteries. For the dKar chag, see Tbrc (W1GS56008). 2. dGe slong bsTan 'dzin dbang grags. Bod ljongs stod mnga' ris skor gsum gyi lo rgyus dang dgon sde khag zhig gsos grub pa'i gnas tshul| spyi tshogs gsar pa'i 'phel shugs sogs rgyas par brjod pa'i 'bel gtam rin chen gter gyi phreng ba. Bod ljongs mi dmangs dpe skrun khang, 636 pp., 1996. ISBN 7-223-00922-5. Another religious history of mNga' ris in four chapters: 1. Chab srid kyi lo rgyus (pp. 19–224), 2. dGon sde'i lo rgyus (pp. 225–386), 3. sPyi tshogs gsar pa'i 'phel shugs (387–464), and 4. Zu rgyan sna tshogs (pp. 465–636). The book also contains colored pictures of the places and monasteries introduced. 3. Ra se dKon mchog rgya mtsho (b. 1953). 'Bri gung chos 'byung. Mi rigs dpe skrun khang, 783 pp. (A4 size, softcover), 2004. ISBN 7-105-06017-4. For the dKar chag, see Tbrc (W27020). 1. La ding and Byams pa skal bzang (ed.). Pho brang po ta la'i ldebs bris ri mo'i 'byung khungs lo rgyus gsal ba'i me long / 布达拉宫壁画源流, / A Mirror of the Murals in the Potala. 九州图书出版社, 303 pp. (A4 size, hardcover in slipcase), 2000. ISBN 7-80114-524-0. 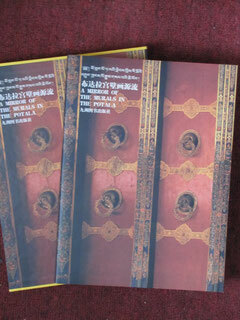 This book includes over two hundred photographs of mural segments of the Potala. The introduction and description of the individual murals are provided in Tibetan, Chinese and English. The book was published in a limited edition of 3000 copies and contains an original print of the 3rd Dalai Lama's official seal on paper. 2. Zla ba tshe ring, bsTan 'dzin rnam rgyal, and Ngag dbang chos grags (eds.). Bod kyi thang ka kun btus / 西藏唐卡大全 / Selection of Tibetan Thangkas. Bod ljongs mi dmangs dpe skrun khang, 220 pp. (larger than A4 size, hardcover), 2005. ISBN 7-223-01811-9. A collection of Tibetan Thangkas presented in 289 colored plates. 1. Karma rgyal mtshan (ed.). sDe dge par khang gi par shing dkar chag bod rgya shan sbyar. Si khrod mi rigs dpe skrun khang, 6, 13, 13, 8, 416, 2 pp., 2010 (2nd edition). A dKar chag in Tibetan and Chinese on the printing blocks of the sDe dge Par khang. ISBN 978-7-5409-3016-5. 2. sPang rgyan me tog (ed.). Bod kyi dmangs srol gces btus. Mi rigs dpe skrun khang, 629 pp., 1999. ISBN 7-105-03638-9. A great collection of research articles on Tibetan customs, traditions and festivals that were previously published in the magazine sPang rgyan me tog. 3. gTsang smyon He ru ka Rus pa'i rgyan can (1452–1507). rNal 'byor gyi dbang phyug chen po mi la ras pa'i rnam thar. mTsho sngon mi rigs dpe skrun khang, 848 pp., 2009 (5th edition). ISBN 978-7-5420-0837-4. 4. Rin chen. gShin po'i 'das mchod byed stangs thar lam bgrod pa'i them skas. Bod ljongs mi dmangs dpe skrun khang, 356 pp., 2010 (4th edition). ISBN 978-7-223-02209-5. 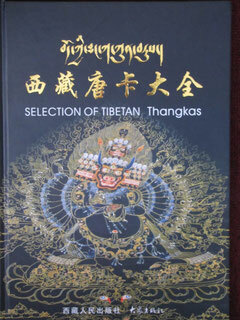 A book introducing the various death ceremonies performed according to Tibetan tradition and presenting an introduction on the Bar do. 5. rDo phun et al. (ed.). lHa sa'i dmangs khrod sgrung gtam. Bod ljongs mi dmangs dpe skrun khang, 2 vols. (stod cha, 534 pp; smad cha, 677 pp. ), 2009. ISBN 978-7-223-02719-9. 6. rDo phun et al. (ed.). lHa sa’i dmangs khrod glu gzhas. Bod ljongs mi dmangs dpe skrun khang, 2 vols. (stod cha, 720 pp. ; smad cha 779 pp. ), 2009. ISBN 978-7-223-02725-0. 7. rDo phun et al. (ed.). lHa sa'i dmangs khrod gtam dpe. Bod ljongs mi dmangs dpe skrun khang, 2 vols. (stod cha, 411 pp. ; smad cha, 415 pp), 2009. ISBN 978-7-223-02724-3.